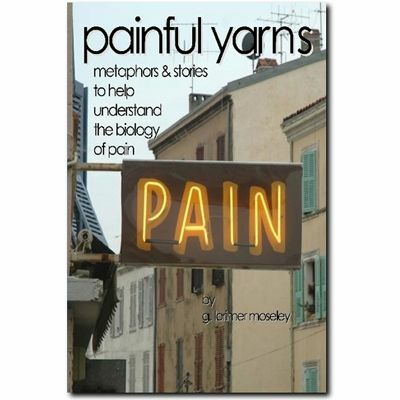 This much anticipated collection of stories, written by clinical neuroscientist and co-author of Explain Pain, Dr GL Moseley, provides an entertaining and informative way to understand modern pain biology. Described by critics as 'a gem' and by clinicians as 'entertaining and educative', Painful Yarns is a unique book. The stories, some of his travels in outback Australia, some of experiences growing up, are great yarns. At the end of each story, there is a section "so what has this got to do with pain?" in which Lorimer uses the story as a metaphor for some aspect of pain biology. The level of the pain education is appropriate for patients and health professionals. The entertainment is good for everyone. You don't have to be interested in pain to get something from this book and a laugh or two! Dr John Keltner, MD (Harvard) Pain Physician, Anethiologist and Research fellow, Oxford University. “Painful yarns are about life. The way Moseley turns them into metaphors about pain is brilliant. This is a real gem.” Diane Wilkinson, Freelance Writer. “I love a good story….but the best bit was that when the stories were compared to how pain works, it made sense.” Dimos, Lorry Driver (not Hino’s), with chronic back pain. Dancing Giraffe Press (2007), 116pp, softcover, burst bound, includes pictures and figures. ISBN: 978-0-9803-5880-3.